Ecuador mega-diversity, from Coastal Mangroves, to Montane, Andean Cloud Forests & Amazonia! As one of UNESCO's 17 declared mega-diverse countries worldwide, Ecuador's National Parks are the showcase for such diversity! As the terrain and climate changes, so does the variety of wildlife. FOUR DISTINCT types of terrain exist on mainland Ecuador, ranging from now rare coastal mangrove swamps, through Altiplano Montane (or páramo) with its cold and high grasslands and unique flora, ​to other distinct flora and fauna that can be seen in Ecuador's lush and cool Cloud Forests, to finally the unique canopy and forest dwellers that can be found in Ecuador's hot and humid Amazonia. Cayapas - Mataje Mangrove Reserve​ (E1) - located in the NW of Ecuador, is the most pristine of its type on the Americas-Pacific coastline due to the negative impact of shrimp fishing in other areas. Especially recommended for spotting marine birds, many otherwise only found on the Galapagos, there is great diversity of other fauna, such as the green iguana, sea otter, sloth, parrot, anteater, and for its famous blue crab. It is also rich in flora, including orchids. Access is by air from Quito to Esmeraldas, from US$ 180/ person economy return. An SUV can be rented from US$ 80/day, and good 3* lodging in San Lorenzo starts from about US$ 75/night/room B&B. Cajas National Park (N6) - located just 30kms west of colonial Cuenca, is a superb example of Andean/Altiplano páramo (or Montane), with its highland grassland flora, sparkling lakes, and unique fauna. This includes puma, coati, porcupines, and the highly endangered Ecuador condor. Also populated by South American camelids like vicuñas, llamas and alpacas. Access is by road from Cuenca. 3* lodging starts from US$ 60/night/room B&B. Llanganates National Park (N4) ​- is located just north of Banos, possessing stunning lakes and river scenery, Cerro Hermoso (4,571m), and great flora and fauna diversity. It is also famed for possibly being the burial location for the "last Inca", Atahualpa, including the legendary El Dorado treasure trove. Bio-diversity here includes more than 800 plant species, over 190 bird species, and some 50 mammal species. Examples include toucans, monkeys, spectacled bears, capybara, ocelot, parrots, jaguar, and Andean tapir. Access ​is best by road from Banos, with lodging costs similar to ​Cajas. 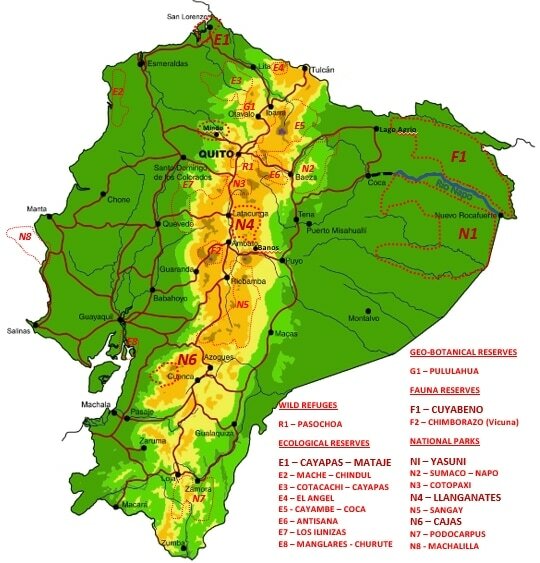 Cloud Forests​ (N4 ​and Mindo) - Included within parks near Banos, such as Llanganates (​N4), and in three small reserves around Mindo, 100kms NW of Quito, visitors to Ecuador are very strongly urged​ to visit a Cloud Forest. Predictions warn that these may be gone in 30 years with current deforestation! Unlike the "hot & humid" flat Amazon rainforest with its lazy, wide muddy rivers and high dense canopy, the Ecuadorian Cloud Forests are "lush & cool", perched on the flanks of the Andes between 1,000 and 2,500m. They support a myriad of flora, from mosses, ferns, orchids, and unique trees such as the Strangler Fig and "Walking Palm Tree" (} 20m per year! ), with clear streams that descend from the heights. From natural vantage points, photographers can get excellent photos of sloth, monkeys, spectacle bear, and birds, especially hummingbirds, toucans and butterflies. Jaguar and puma are also present. And NO malaria or Zika! Charges for a 3 day/2 night tour at a 4* lodge at Mindo start from US$ 370/person (minimum 2 persons sharing, including round trip transfer Quito - Mindo; lodging; all meals (less bar); group guiding (max 8 pers); local taxes). Tip: All visitors to Amazonia must check with their local health authorities for advice on Yellow Fever and dealing with possible Malaria and Zika risks. ​​​Land Tour Cuyabeno Reserve​ - a superb value 4 day/3 night package can be enjoyed at Cuyabeno from US$ 410/ person (2 persons sharing, including all meals (less bar), lodging, transfer from/to Lago Agrio, excursions with bi-lingual guide). Land Tour Yasuni National Park - a delux 4 day/3 night experience can be enjoyed at Yasuni from US$ 1,200/ person (2 persons sharing, including all meals (less bar), lodging, transfer from/to Coca, excursions with bi-lingual guide). ​Amazon Cruises​ - 4-, 5- and 8-day cruise options on the Rio Napo from Coca (2 persons sharing in standard cabin, including all meals (less bar), lodging, transfer from/to Coca, excursions with bi-lingual guide. Extra charges for Park Entry Fee (US$ 70pp), Airport Taxes, additional activities (eg Glamping option), tips). ​​​​M/V Anakonda - 4 day/3 night luxury cruise from US$ 2,743/person. M/V Manatee - 4 day/3 night luxury cruise from US$ 1,959/person.